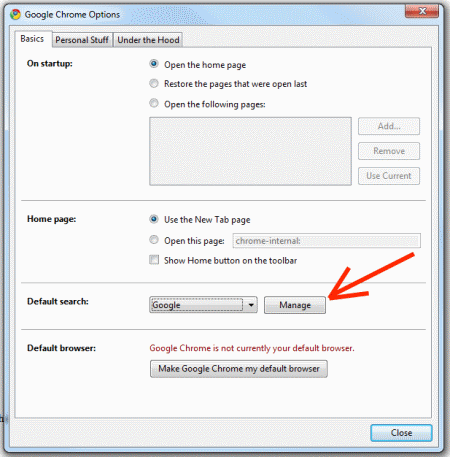 How to add or remove search engines in Google Chrome? Google Chrome lets you search for things on the web right from the address bar. Although Chrome has four search engines to choose from, you may like to add more search engines or even remove some. In this article we will tell you how to do so. 1. 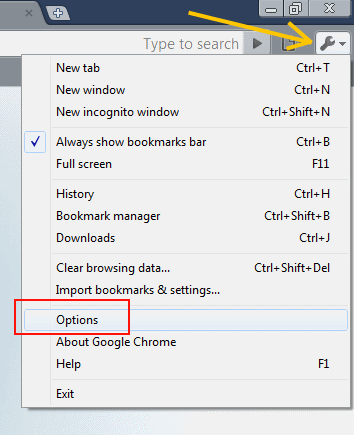 Start Google Chrome and open the Chrome Options window. 2. From the windows that opens now, select the Basics tab. In this tab you have to click a button called Manage under the Default Search section. 3. Now a new window opens that has the list of available search engines. 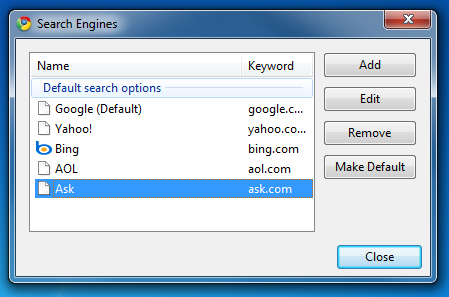 From the options on the right you can either remove them or add new search engines as you like. We have already told you how to make a particluar search engine as default, well you can make a search engine default from this menu too! Chrome add/remove search engines dialogue!